There is sufficient evidence, drawn from surveys of innovation in the public sector and cognitive testing interviews with public sector managers, to provide basic recommendations for how to measure innovation in the public sector. The recommendations recognize the unique characteristics of the public sector and are intended to provide useful information for policy efforts to improve the innovative capabilities and innovation outcomes of public sector organizations. Important topics for measurement include the characteristics of survey respondents and their workplace, innovation drivers, resources for innovation, innovation processes and strategies, innovation outcomes, novelty of innovations, and obstacles to innovation. 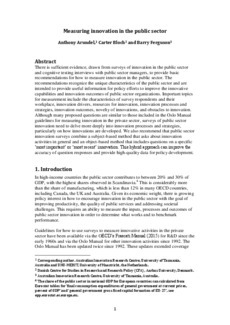 Although many proposed questions are similar to those included in the Oslo Manual guidelines for measuring innovation in the private sector, surveys of public sector innovation need to delve more deeply into innovation processes and strategies, particularly on how innovations are developed. We also recommend that public sector innovation surveys combine a subject-based method that asks about innovation activities in general and an object-based method that includes questions on a specific ‘most important’ or ‘most recent’ innovation. This hybrid approach can improve the accuracy of question responses and provide high-quality data for policy development.